A research team from the Research Institute of Mechanics, MSU together with a colleague from the Center of New Space Technologies, MAI described the behavior of a liquid sheet propagating in open space. The results of the study were published in the Physics of Fluids journal. Under standard conditions, the stability of liquid sheets generally depends on their interaction with the air. The predominant effect (the so-called Kelvin-Helmholtz instability) manifests due to the liquid-air friction. The difference in the velocities of the gas and the liquid results in the onset of ripples, waves, and the formation of droplets near the liquid surface. Wind-generated waves on the surface of water are among the best-known examples of this instability. The authors of the article studied the behavior of a liquid sheet in vacuum, when no interaction with the environment occurs. In the study, the authors considered the so-called vacuum oil, i.e. a liquid whose viscosity, thermal conductivity, and surface tension coefficients vary substantially with temperature. Such liquids are used in oil-vapor pumps, among other things. Studying the liquid-sheet behavior in open space is relevant to the development of new spacecraft cooling technologies. In the future, so-called droplet cooling radiators may be used to control the thermal regime of long-mission spacecrafts. In these devices, the liquid of the cooling system is fragmented by special atomizers and turns into a layer of liquid droplets moving in the open space. Since the layer of droplets has a large radiating surface, the heat is more efficiently released and the liquid is cooled more intensively. At the same time, a serious problem arises, as these drops have to be collected, liquefied, and returned back onboard the spacecraft. One of possible solutions of this problem is to collect the cooled drops onto a specially organized liquid sheet. The main issue of the paper is to study the hydrodynamic stability of such a sheet in the open space conditions. "Liquid films and sheets tend to be broken into droplets due to the Kelvin-Helmholtz instability, associated with friction between air and liquid. However, this disability is eliminated in open space; accordingly, we need to study other possible mechanisms of instability and reasons for liquid fragmentation. We determined what other types of instabilities may occur in liquid sheets when they propagate in vacuum, but their flow is considerably non-isothermal due to heat radiation from the sheet surface," explained Professor Alexander Osiptsov, a co-author of the work and the head of Laboratory for Mechanics of Multiphase Media, Research Institute of Mechanics, MSU. 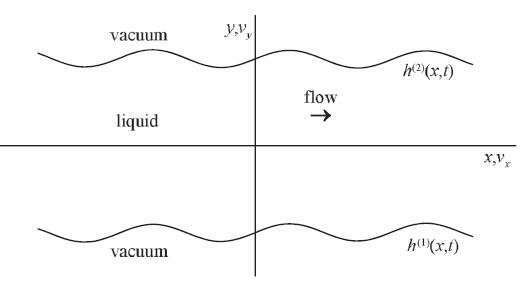 Using the classical approaches of hydrodynamic-stability theory, the researchers gave a mathematical explanation of the behavior exhibited by a vacuum-oil sheet in the open space. It turned out that in the absence of the main (Kelvin-Helmholtz) instability mechanism, other instabilities may develop, namely those associated with viscosity and surface tension gradients. Due to the heat radiation from the sheet surface, temperature differences arise both along the surface of the sheet and inside it. In turn, these temperature gradients cause nonuniformities in the viscosity and surface tension and the onset of new instability mechanisms. The scientists described the occurrence of instabilities in a flow of liquid from the mathematical point of view, studied the development of short- and long-wave disturbances with time, and determined the most 'dangerous' of them. In future work, the scientists plan to continue the development of the theoretical model and to describe more complicated processes that may occur in the system. "By now, we've studied only the initial stage, i.e. the behavior of small disturbances. We've determined the conditions when the disturbances are damped or grow and established the instability criteria. In the future, we'll have to deal with more complicated problems: to study the development of disturbances in the non-linear stage, to estimate the time intervals over which areas of nonuniform thickness of the sheet or even holes in it are formed, and to find the rate of sheet's fragmentation into droplets. And that is most important, we have to learn how to control the process and stabilize the sheet flow regime in open space," said Osiptsov.